Only send any or all scores (SATs, AP, ACTs) to one UC school on their application because the UC system shares your scores, major preferences, and general information found on the application. On College Board, send your scores only to one UC school. On your personal essay, don't waste time using filler words (such as, describing the setting of an event or location) and instead, focus on how events have changed or affected YOU and what you have learned about yourself. Do NOT make your personal essay too specific to a UC school, instead keep things in general. UC system does not accept late applications. All applications are due on November 30th of every year. Submission decisions will come in early March. No need for letters of recommendations, resumes, or have interviews. Only UC Berkeley will start conducting interviews but they will reach out to the student directly for this. For more application tips, please visit the UC Santa Barbara website which provides many general UC application tips including webinars. Are you having trouble with your UC application? Call the UC Application Help Desk at: 1-800-207-1710. Click here to go to the official UC website. All students must complete the FAFSA by March 1st each and every year. Click here to learn more and find helpful tips and resources. Your EAP scores are embedded in the SBAC. Click here to learn how to share your scores and what to do if you forgot to. 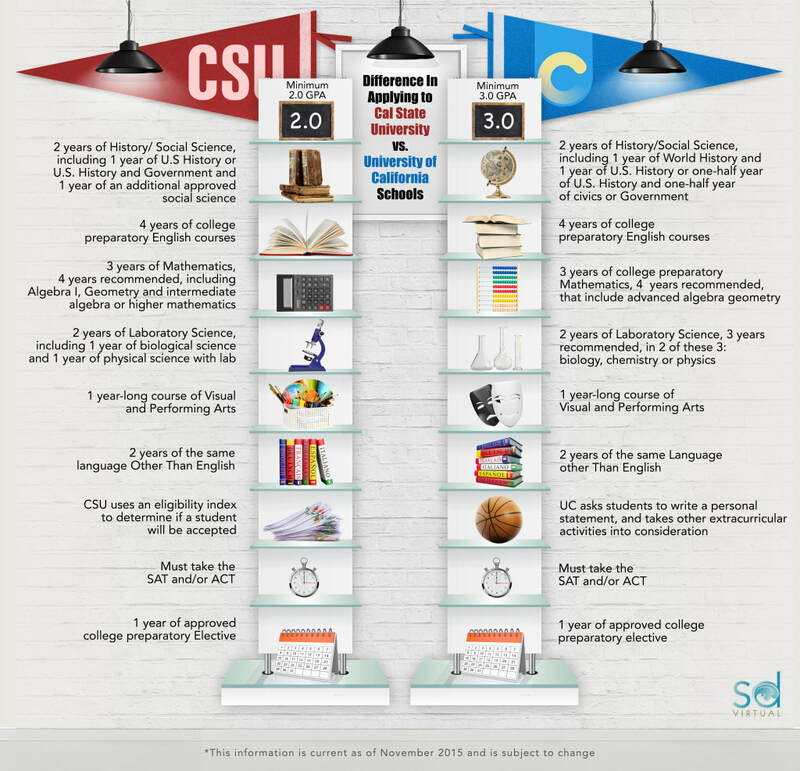 ​View this infographic to view the differences between the requirements for CSU versus UC system.